One of the best action MMORPG’s on browser has a brand new hero coming, and he’s ready to slice up the competition! 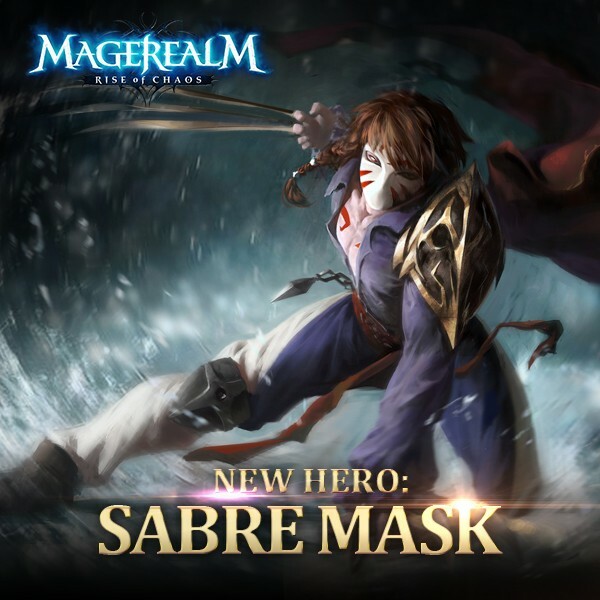 Magerealm is happy to announce Sabre Mask, a mysterious vigilante that has taken it upon himself to root out evil wherever it may lurk. Answering to no one, Sabre Mask will only follow those who have earned his respect. Vital Strike is Sabre Mask’s main attack skill and provides good damage and a Crit buff to increase all following damage. He has two powerful AOE attacks with Bloodstorm and Vampiric Touch. Both do significant damage to all enemies, while Vampiric Touch will also heal Sabre Mask for 30% of ALL it’s damage. Since this is an AOE skill, you can expect to be fully healed nearly every time this skill is unleashed. One key to note is that all of Sabre Mask’s damage skills are partially based off his max HP, so increasing his HP will also increase his damage. Sabre Mask’s three passive skills also cover all the bases. With Hemorrhage, all his attacks have a chance bleed the enemy, causing additional damage while reducing their Hit rate. His Overdrive passive will greatly increase Sabre Mask’s damage, while giving him immunity to control effects. Finally, proccing Blade Parry will allow him to block all damage for 10 seconds. Has this masked fighter peaked your interest? Add Sabre Mask to your team and he might just unveil the secrets behind the facade. Follow Magerealm on Facebook or GTArcade and visit the official forums to get the latest news and participate in rewarding events. Come experience a huge fantasy world of steel and magic in this action MMORPG, all for free!